St. Pete Friends have been busy! Our goal is to host or participate in at least one outreach endeavor a month. We are pleased that we are beginning to see new attenders coming for Meeting for Worship who have met us at our outreach events. In December we hosted a wreath making party and sold the wreaths. 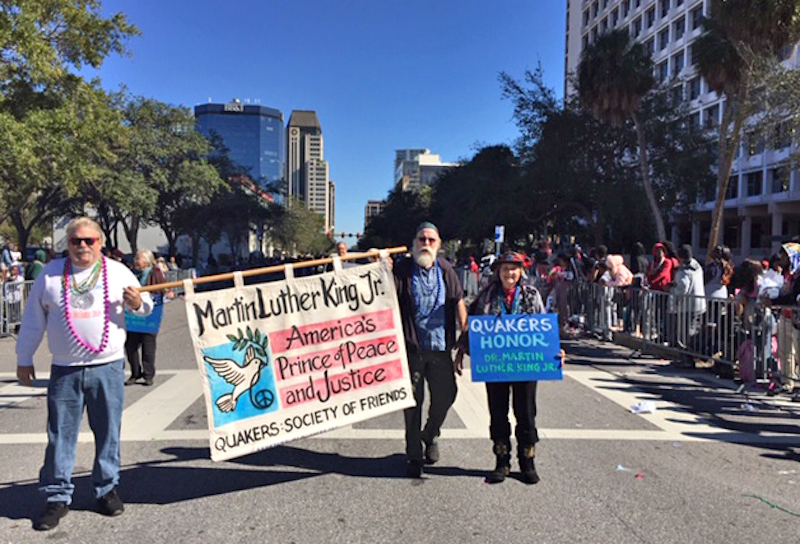 In January we marched as a group in the nation’s second largest MLK parade here in St. Pete, where we were well received. 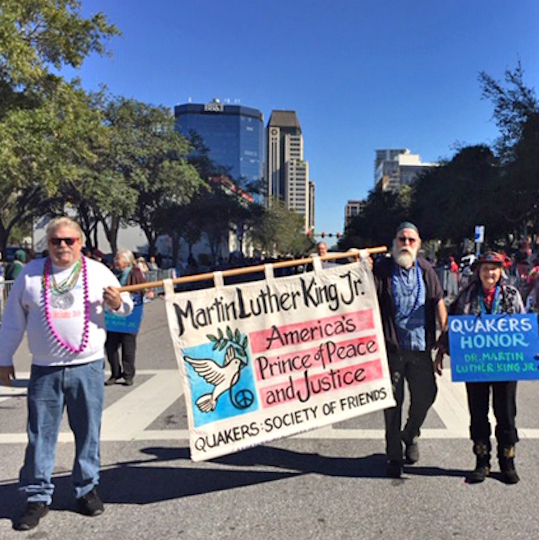 It was so uplifting to hear members of the parade crowd shout things liked “Yeah Quakers!” and “Thank you Quakers!” to us as we marched along. We also had an outreach table at the street festival that followed it. 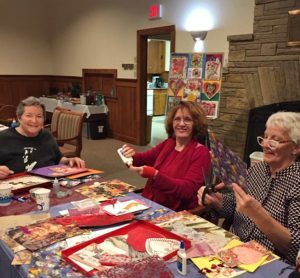 In February we shared the love by hosting a Valentine Day card making party. Our cards were to each other, to mother earth and for causes. In March we had an exhibit booth at the Peace, Love and Pride event in Gulfport, which showcased the many accomplishments of the LGBTQ community in that town. Gulfport is a small artsy suburb of St. Pete. Along with our friends at Allendale United Methodist Church we also were a co-sponsor of a film dealing with Syrian refugees. 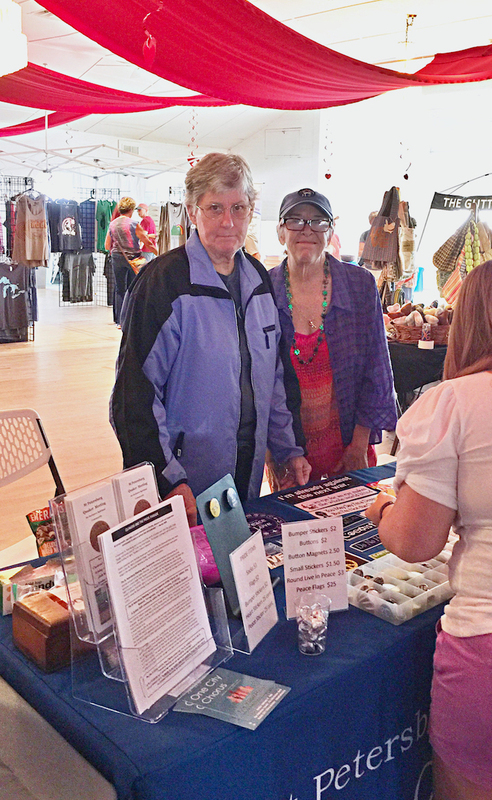 We had a booth at the St. Petersburg Literary festival at the James Weldon Johnson Library and Community Center, which has a long history of serving the African American Community. Coming up in April, we plan to have a big booth and planned activities at the St. Pete Earth Day celebration, and also to host an informational table about our Meeting at SEYM’s upcoming Annual Gathering. Later in June we plan to host a booth at the St. Pete Pride celebration on June 23rd. We invite SEYM Friends to visit stpetersburgquakers.org to keep up with all of our activities. What has your Meeting or Worship Group been doing for outreach that is drawing in new attenders?